Sugar maple heartwood is more susceptible to decay and discolouration than the sapwood. 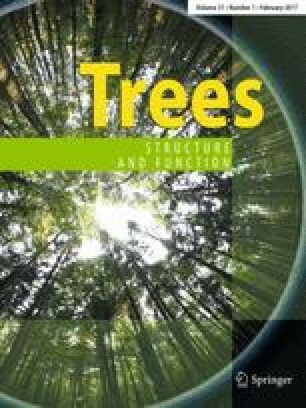 To understand heartwood formation, foliage, sapwood, heartwood, and discoloured wood areas as well as other biometric variables were measured on 79 trees sampled in two sites in south-eastern Quebec, Canada. Tree growth was related to heartwood formation and discolouration with a modelling approach. Heartwood formation increased with tree height, age, and crown size, but decreased with increasing leaf area to stem basal area ratio. In general, the proportion of discoloured heartwood increased with an increasing rate of heartwood formation. However, for trees visually classified as vigorous, the proportion of discoloured heartwood tended to decline with an increasing rate of heartwood formation. This indicates that the size/age-related increase in discoloured wood proportion in sugar maple is possibly due to older trees being more likely to have injuries and inoculations by fungi. Thus, residual stands composed of high vigour trees can likely maintain higher growth while minimizing discoloured wood proportion. The online version of this article (doi: 10.1007/s00468-016-1459-5) contains supplementary material, which is available to authorized users. We gratefully acknowledge the financial support that was provided by FRQNT (Fonds de recherche du Québec—Nature et technologies), NSERC (Natural Sciences and Engineering Research Council of Canada), and the Quebec Ministère des Forêts, de la Faune et des Parcs. Support is gratefully appreciated for field work and the sampling design that was provided by Filip Havreljuk, Université Laval. We thank two anonymous reviewers for their comments. We also thank Sébastien Guénette, Alain Forget-Desrosiers, Valérie Guèvremont, Emmanuel Caron-Garant, Audrey Gagné-Delorme, Geneviève Dubreuil, Jean-Christophe Dubreuil, and Genevieve Degre-Timmons for their help in the field and laboratory. The authors have declared that there is no any conflict of interest. The work was supported by a grant from the Fonds de recherche du Québec-Nature et technologies (2010-FT-136016).